Citation Information: J Clin Invest. 2014;124(2):482-485. https://doi.org/10.1172/JCI74141. Systemic lupus erythematosus (SLE) is a devastating autoimmune disease characterized by chronic inflammation and systemic destruction of host organs or tissue. A key feature of SLE is T cell dysfunction characterized by hyperresponsive antigen receptor signaling. In this issue of the JCI, McDonald and colleagues provide evidence that homeostasis of a subset of lipids, the glycosphingolipids (GSLs), is severely perturbed in the membranes of T cells from SLE patients. Furthermore, normalization of GSLs restored TCR signaling and ameliorated T cell dysfunction. These data suggest that targeting host metabolism may be an effective means of reinforcing self-tolerance and attenuating autoimmunity. Resetting GSL homeostasis restores SLE T cell dysfunction. (A) Lipid rafts are cholesterol- and GSL-rich microdomains in the plasma membrane that play important roles in regulating TCR signaling. In healthy individuals, the amount of cholesterol and GSLs is tightly regulated in quiescence. Activation increases both GSL and cholesterol levels in T cells, which then return to quiescent levels following removal of activation signals. 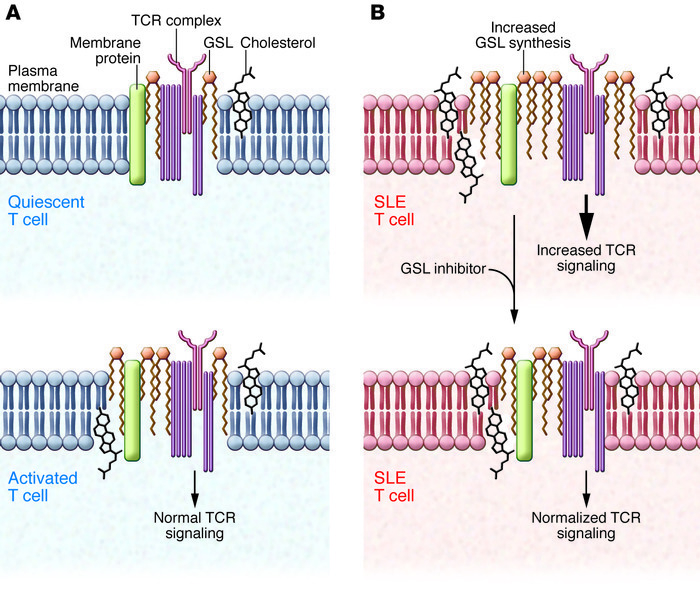 (B) SLE T cells have altered GSL and cholesterol homeostasis in lipid rafts that results in abnormal TCR signaling. Pharmacologic inhibition of GSL synthesis in SLE T cells restores GSL homeostasis, normalizes TCR signaling, and attenuates lupus T cell dysfunction, indicating crosstalk between lipid metabolism and T cell function.